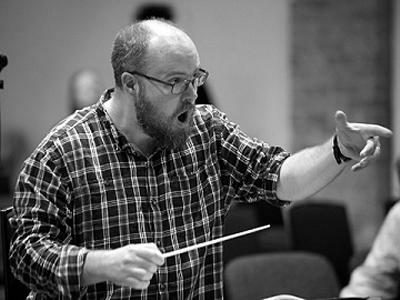 Dr Benjamin Oliver is Associate Professor in Composition at the University of Southampton. In the 2018-2019 academic year I am Undergraduate Admissions Tutor for Music. I completed my AHRC-funded DPhil in Composition at the University of Sussex under the supervision of Sam Hayden in 2010. Following work as a postdoctoral researcher at Southampton, I began teaching at the University in 2011. I teach modules including: Composition Fundamentals, a first year composition based module that introduces students to a range of ways of thinking about composition; Composition Workshop A and B, modules for second and third year students that introduce 20th and 21st century compositional techniques and approaches; and Composition Portfolio, a third year module that includes seminars introducing further compositional methodologies, as well as one-to-one supervision and performance workshops. I also supervise a range of MMus portfolios and PhD projects. More than fifty of my works have been performed by orchestras, ensembles, choirs and soloists. Recent commissions and performances include: London Sinfonietta (Sounds New 2012; ‘Alternative Visions @ The BFI’, 2014; ‘Notes to the New Government’, 2015; Sinfonietta Academy 2016; Sinfonietta Short for solo percussion, 2017); ensemble mise-en (Mise-en Music Festival 2014 and 2018, New York); BBC Symphony Orchestra (Sound and Music Commission, broadcast BBC Radio 3, 2013); Ensemble Paramirabo (Montreal, 2016); pianist Yshani Perinpanayagam (Kammer Klang, 2017; Nonclassical, 2016); and lutenist Elizabeth Kenny (Various, 2014-2017). Alongside my composition activities I have also worked as a conductor, arranger, electronic musician and jazz pianist, and conduct the Workers Union Ensemble. In February 2017 I directed the ‘Loop Project’, which featured Southampton students performing my ‘Loop Concerto’ alongside leading jazz musicians Ivo Neame, Jasper Høiby and Jon Scott and in January 2019 will lead a project built around Steve Reich’s Music for a Large Ensemble (1979). This AHRC-funded collaboration between Music and colleagues in Southampton's Institute for Sound and Vibration Research explored ways of helping deaf people with cochlear implants to get more enjoyment from music. Professor Michael Finnissy’s ‘Chi Mei Ricercari’ is a new work for cello and piano, written especially for three historic cellos from the world famous Chi Mei Culture Foundation collection of stringed instruments. It is heard in full for the first time on 10 December 2013 at Taiwan’s National Cheng Kung University in Tainan, on 11 December at National Chiao Tung University in Hsinchu and 12 December at National Taiwan University in Taipei. Hodkinson, S., Van Besouw, R., Nicholls, D., Oliver, B., & Grasmeder, M. (2016). The Interactive Music Awareness Programme (IMAP) for cochlear implant users. IMAP Online. Oliver, B., Polfreman, R., Metcalf, C., & Halford, D. J. (2018). Capturing the contemporary conductor: Using motion-capture technology to study conducting gesture. Paper presented at Oxford Conducting Institute International Conducting Studies Conference 2018, Oxford, United Kingdom. Polfreman, R., & Oliver, B. (Accepted/In press). Rubik's Cube : Music's Cube. The International Conference on New Interfaces for Musical Expression, Copenhagen, Denmark. Oliver, B. R., van Besouw, R. M., & Nicholls, D. R. (2012). The ‘Interactive Music Awareness Program’ (IMAP) for cochlear implant users. New Interfaces for Musical Expression (NIME), United States. Oliver, B. (Author). (2011). Momentum. Composition, FR: .